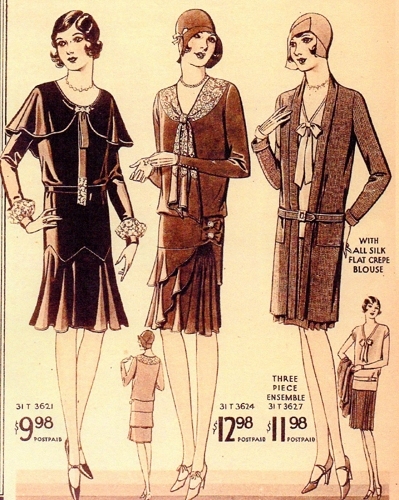 A page from the Fall 1925 Sears catalog, now accessible online at Ancestry.com. 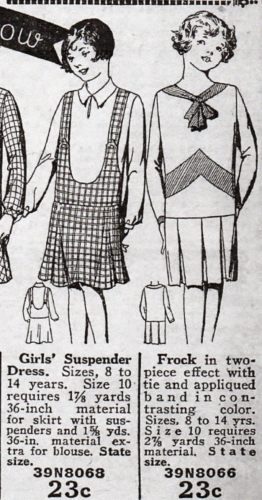 When I wrote about Butterick’s “suspender skirts” from 1925, I found another example online in the Sears, Roebuck catalog from Fall 1925, but I wasn’t able to convert the image to a JPG file. Today I found a work-around. I also learned how wonderful the Sears Catalog archive at Ancestry.com really is. 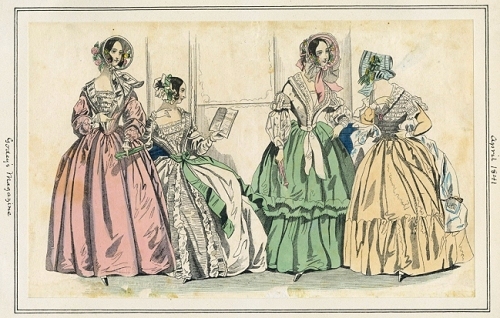 For years, costumers and others interested in the history of everyday fashions treasured the exerpts published by Stella Blum and her successors in the “Everyday Fashions from Sears and Other Catalogs” series of Dover books. Now, you can see complete Sears Catalogs from 1896 to 1993 at Ancestry.com. Every page is scanned, it is searchable, and you can set it for a full page view and skim through several pages easily. When you find something you want to examine closely, you can zoom in as much as you want. And you can print your own copies of a page or part of a page. The bad news is that you have to join Ancestry.com to access them. The good news is that you can get a free trial subscription to Ancestry.com and explore this resource before you commit to a $19.99 per month subscription. Lynn at American Age Fashion wrote about this resource in January, so I tried it, but I had to phone for help finding the Sears catalogs, so I’ll tell you how to find them, later. Misses’ suspender skirt #6017, with blouse #5903. 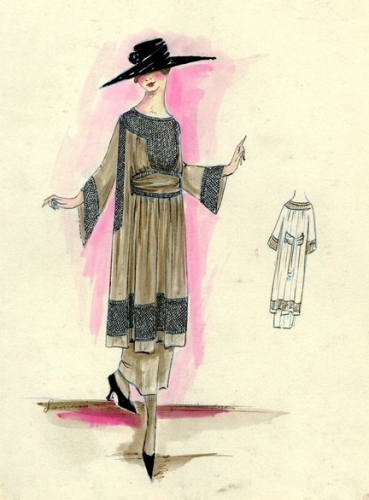 Butterick, May, 1925. A suspender skirt (note the deep armholes) from Sears. 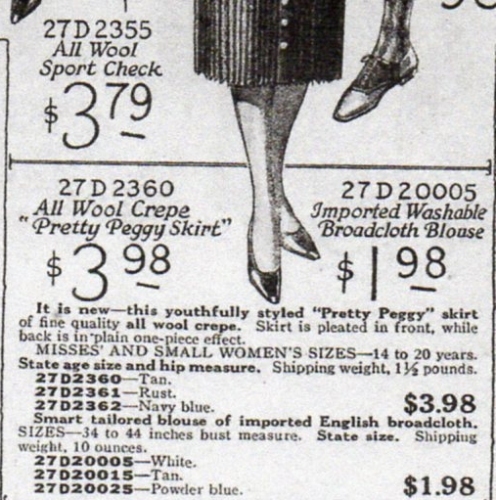 It is called the “Pretty Peggy Skirt” in the Fall 1925 catalog. A search for “Pretty Peggy” led to song lyrics, a kind of doll, and — so far — no other suspender skirts. A “Peggy” skirt was also popular in the 1950s — in England, it looks like a full skirt — with no suspenders. Spring 1926 Sears catalog pattern 39E7061 for a suspender skirt. 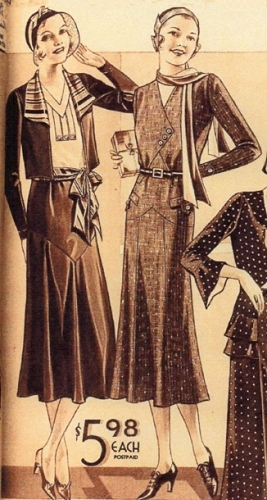 A search for “suspender skirt pattern” in Google images brought up versions going back to 1910s and many from the 1940s, 50s, and later, but not these 1920s versions. I find it interesting that the pattern illustrations for Sears used a more realistic human figure than those from Butterick. 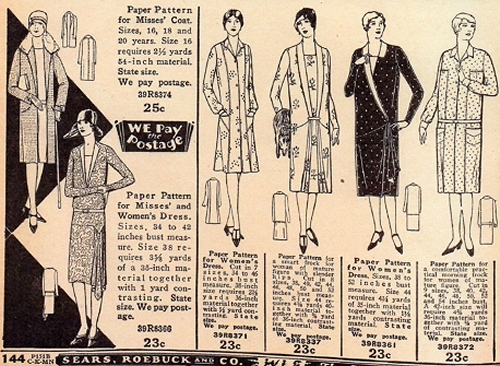 Sears pattern illustrations from Spring 1926. Pattern illustrations from Sears catalog, Spring 1926. 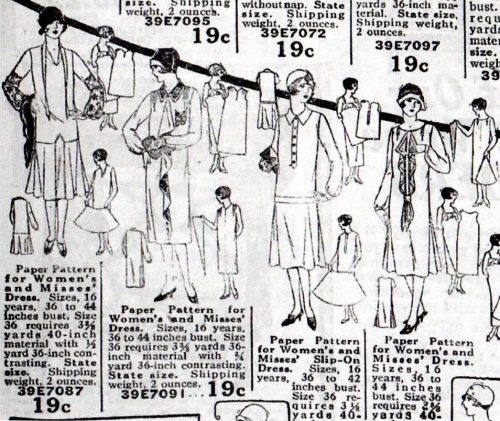 Sears pattern illustrations from Spring 1929 catalog. Even Lane Bryant catalogs were not this honest about size 52. 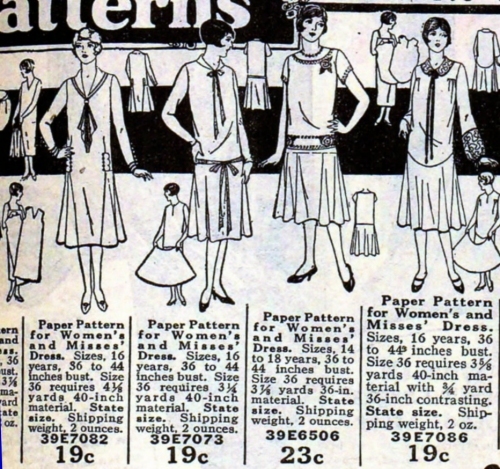 Women’s pattern measurements from Sears, Spring 1929. Page 146. 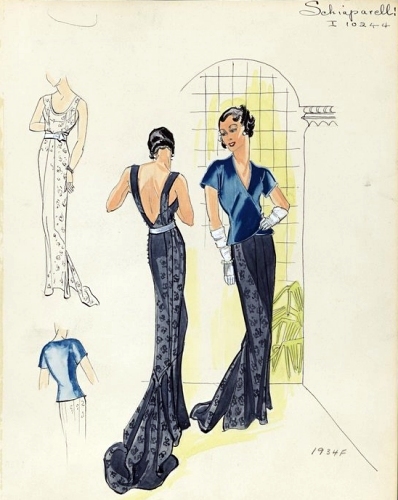 Here is a simple demonstration of how useful these online catalogs can be; I wanted to find out how quickly hems dropped in the mass market — as opposed to high fashion — between 1929 and 1931. 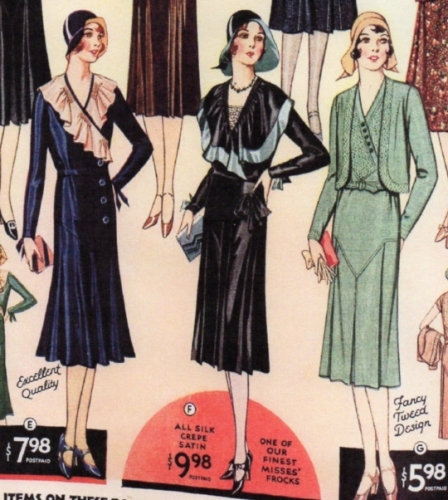 1929: Misses’ dresses from the Fall Sears catalog, p. 127. Hems are at mid-knee. Kneecaps exposed. 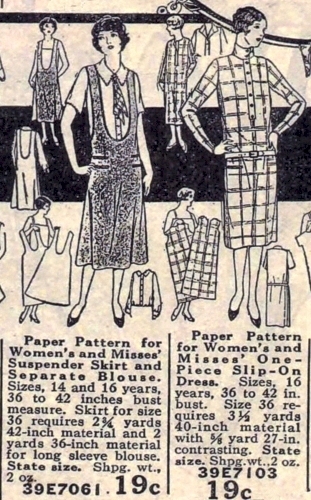 1930: Misses’ dresses from the Fall Sears catalog, p. 44. Hems are one or two inches below the knee. 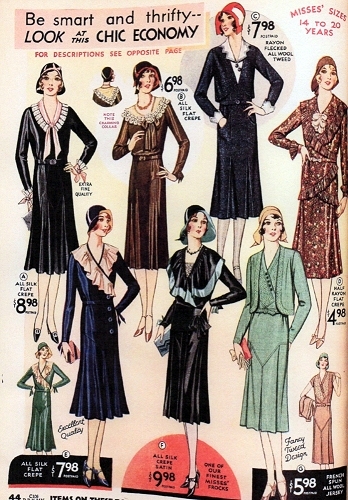 1931: Misses’ dresses from the Fall Sears catalog, p. 35. Hems are approaching mid-calf. 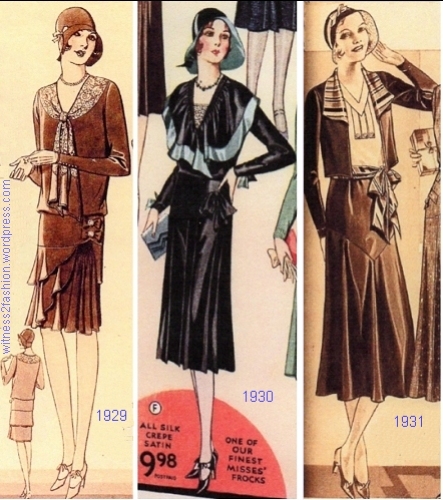 Misses’ Dresses from Sears catalogs one year apart: 1929, 1930, 1931. 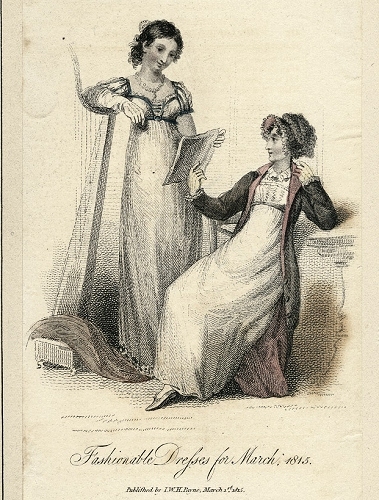 I decided that, as a research tool which includes clothing for all ages — men, women, boys and girls; occupational uniforms; shoes; underwear and hosiery; nightwear; hats, purses and other accessories; and prices for all of them, access to 97 years of these catalogs is worth $20 per month. After you sign up for a trial membership, look for Search on the horizontal bar. The Sears link is in Ancestry.com under “search” > card catalog > collections > newspapers and publications > periodicals and magazines > Historic Catalogs of Sears Roebuck and Co. Once there, you can search by keywords, year (exact or plus/minus 1 year, etc.) You can print a zoomed image of any page — there’s a tiny, olive green printer icon next to the facebook icon. The Gentleman’s Magazine Library (1700s to mid 1800s) and Illustrated London News up to 1900 are also available, along with access to a vast number of newspapers. My workaround: The images in this post were printed on paper and then scanned to get them into JPG format. The print quality is very high. NOTE: If you don’t want to commit to paying monthly membership dues to Ancestry.com, be sure to opt out before your free trial deadline expires!